Got some catch-up to do with the blog, but the sketches will do for a tease until then. Water was supposed to be a worry, but this rock box with water pouring over the sides showed it was needless while hiking up the Comanche Trail. 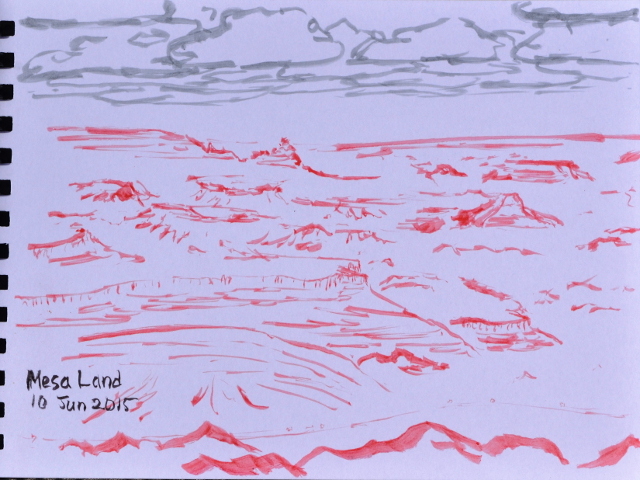 There is a vast land of flats all at different levels looking over southern Utah and Arizona. 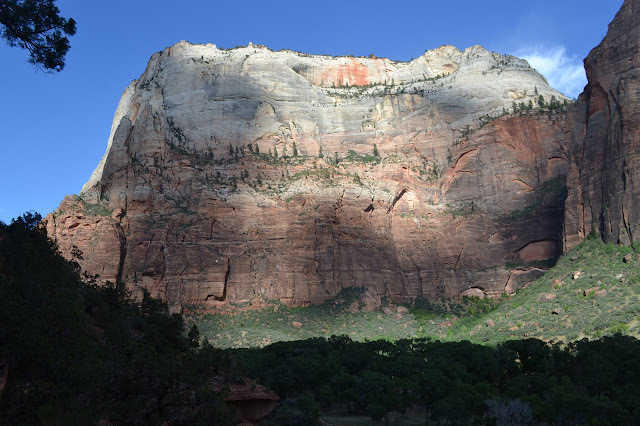 Kolob Canyons are a dominant feature when there are views to the west. Some more close at hand rocks among the aspen trees. 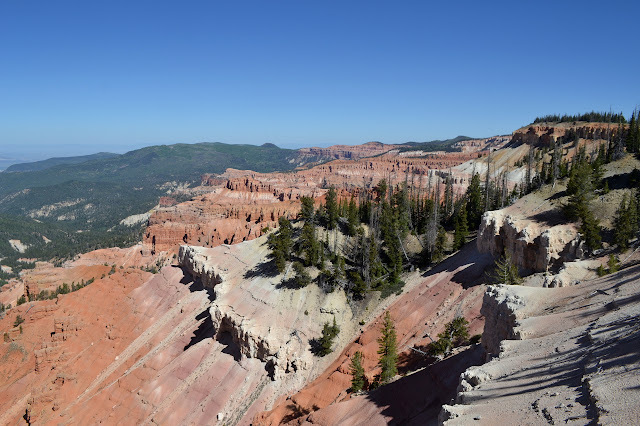 Walking in Fairyland in Bryce Canyon. On my way up the east fork of the Cimarron river and enjoying the cliffs with their scattered trees. We like to see patterns even when there is none to see. 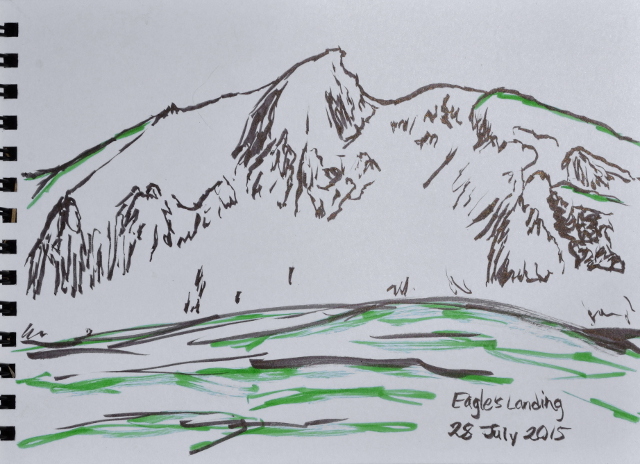 This peak to the south seemed very much like an eagle with wings outspread to me. Playing a little with getting the patches of snow in and dealing poorly with there being a lot of rock between the Wetterhorn and Matterhorn. (Day 4 of 6) Wetterhorn Peak also has fairly close access from the road and sitting up on the hill, I can watch them wandering up the trail. One group seems to be moving a little oddly, dawdling here and there and popping up on rocks waving their arms about. They pass by the junction as I finish breakfast and I am sure they are past by the time I have everything cleaned and packed, but end up startling them a bit as I pop out from behind the trees. We chat as we attempt to navigate the creeks without getting wet feet. It seems I have fallen in with some famous climbers out showing a brother and his son some class 3 climbing. Up on the edge of the basin, there is a pair of skittish elk. We pass by large number of marmots who are not skittish as the green meadows yield to snow. Climbing up Matterhorn Basin to Wetterhorn Peak. 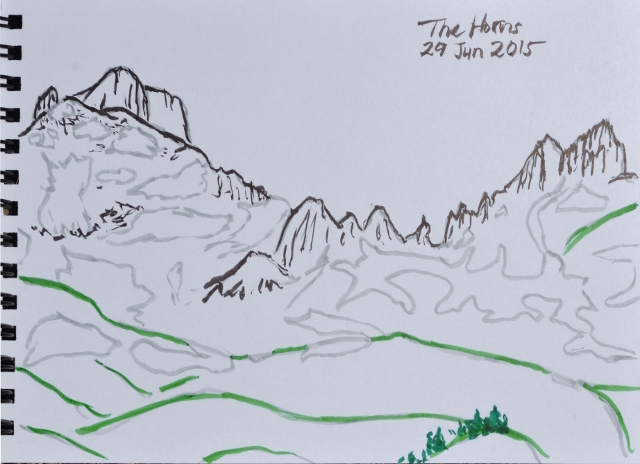 The target for today: Wetterhorn Peak. (Day 3 of 6) Things are wet in the morning from a few brief rains overnight. Today is an short day starting with a day hike attempting Uncompahgre Peak and I can leave the camping gear to dry while I do that. 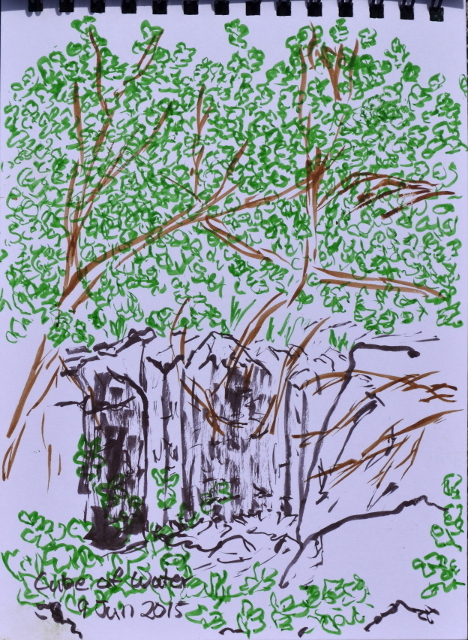 A couple posts can be seen climbing the hills, marking where the trail passes. The trail climbs very steeply to the first one along a couple tracks. A couple elk on it last night took the less steep one, and I agree with them. The snow is fairly solid when I hit it, sometimes a little too solid. The snow fields around Wetterhorn Peak look difficult to deal with leading to worry about getting up this slightly higher peak. 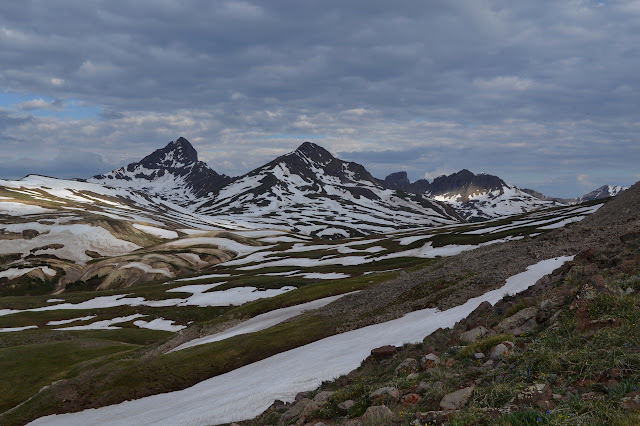 The section of the San Juan Mountains to the south start to reveal themselves. 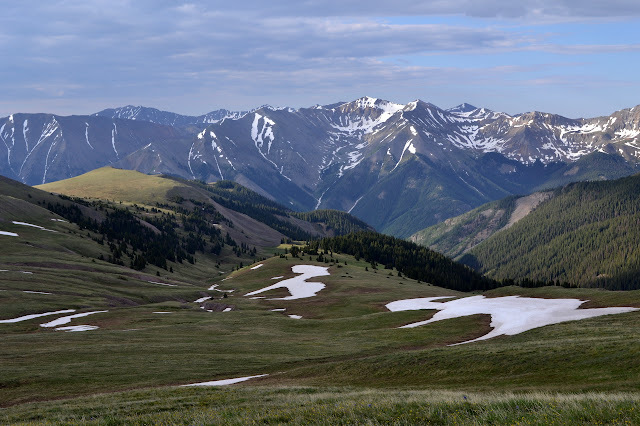 Snow fields are under Uncompahgre Peak, too, but now I can see the trail avoids much of it. One day hiker is along the ridge ahead. (Day 2 of 6) The night was cool, but not freezing. Today, I will find out if it is too early to get out of the canyon because of snow. It is all melting just about as fast as it can. A little breakfast, a little packing, and I am set to really start the trip. I drop back to the trail below and start up the gentle slope beside the East Fork once again. The crags across the river from camp in the bright morning light. 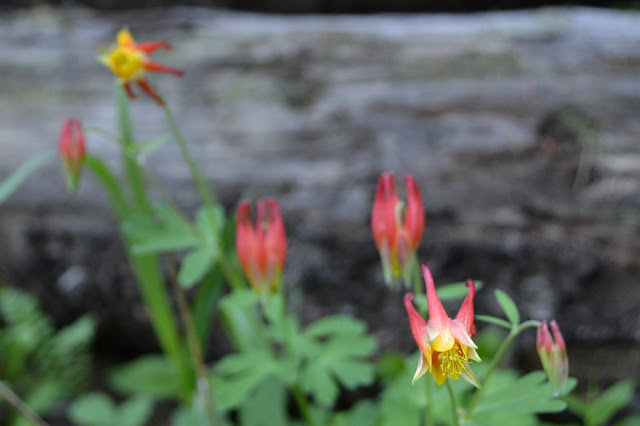 The few columbines along the trail are the least frilly I have seen. A glance up the East Fork. (Day 1 of 6) The Colorado backpacking loop I found last year was stunning, so now I am out for another. 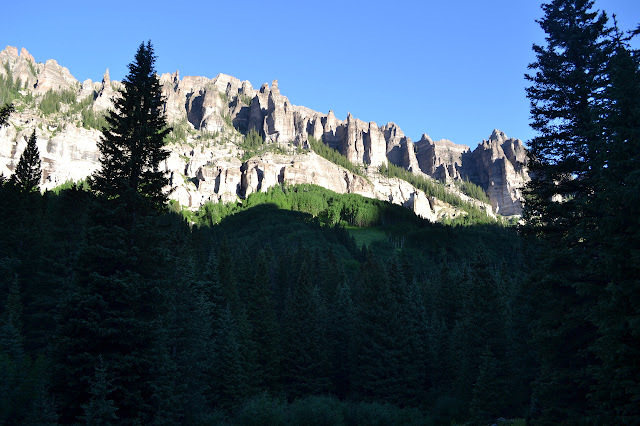 This year I chose a loop mainly in the Uncompahgre Wilderness following different forks of the Cimarron River up and back down connecting over the ridges to the south. This gives me access to two 14ers with trails most the way up. All this depends on the snow, of course. It is a little early in the season and a late snowfall may mean I cannot get out of the canyon, much less climb a mountain that is 14,300 feet high. I have been casting my eyes toward the San Juan Range for the last few days, and they do look very snowy. 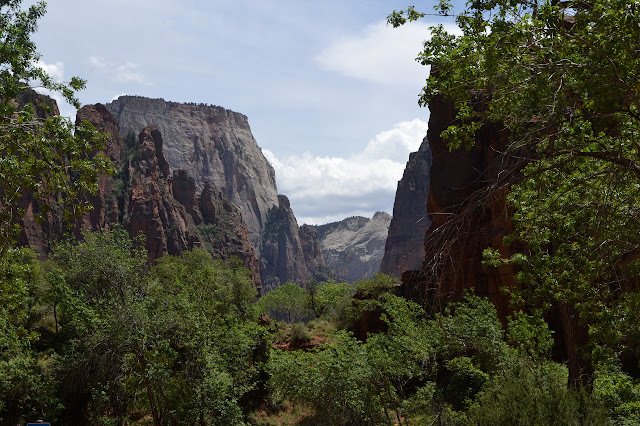 It seems unlikely that I will get out of the canyon and I am a little resigned as I collect everything together. 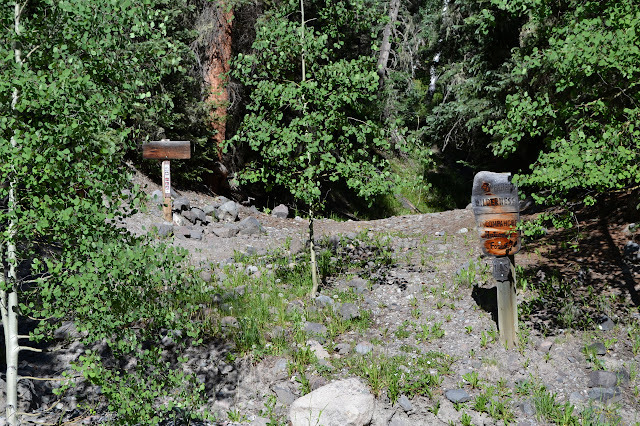 The day hikers who went up to the Silver Jack Mine do not offer much hope. The trailhead says "no camping" so I stuff in one more supper and breakfast and start off a little earlier than planned. There is only one entry in the register left without an exit time. 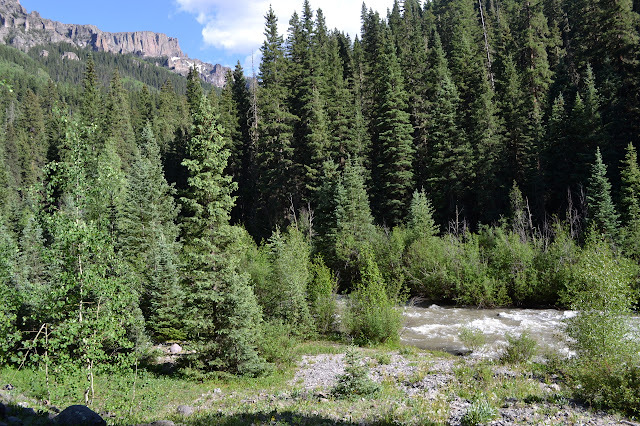 Entering Uncompahgre Wilderness just past the parking lot. Looking across the East Fork and up to the ridge that separates it from the Middle Fork. 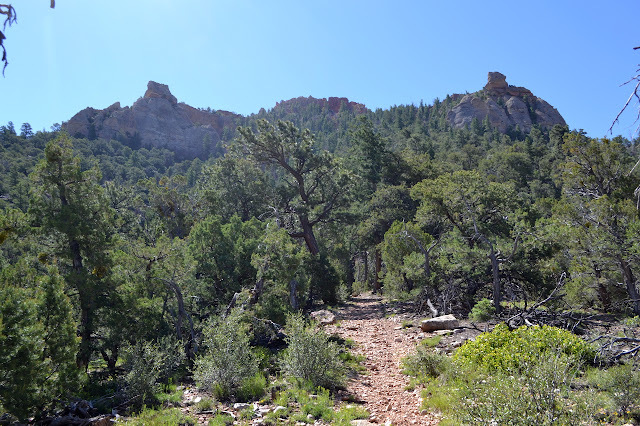 Rather than go to a high point on the mesa, like Crag Crest, this trail travels the typical top of the mesa that claims to be the highest flat top mountain in the world. I thought it would make a nice evening hike. 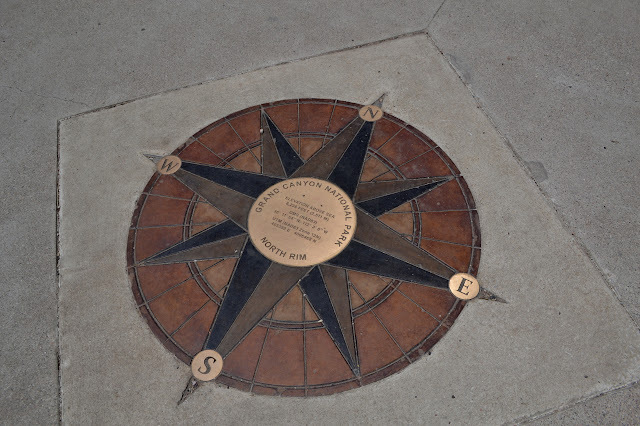 This is another that is not on my map, although it is well signed from the road. (It is a Trails Illustrated 136 Grand Mesa map that seems so incomplete.) There is a map at the parking lot showing a trail progressing a few miles southwest with connector trails to the road to the west. I think I will maybe do a little loop and a couple hours. 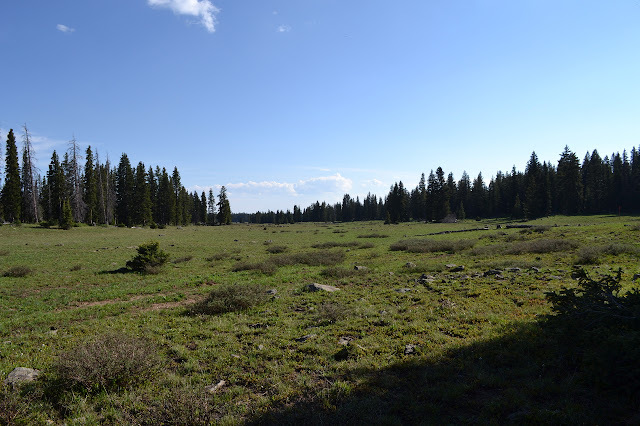 Wide grasslands lined with pines at the top of the mesa. Past a line of pines, there is wide grassland just getting started. It looks like it becomes cow pasture eventually, but is not yet. A faint old road seems to travel the middle of the meadow. 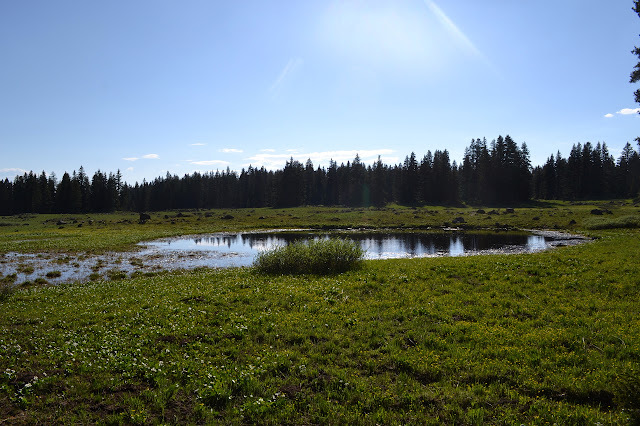 Dotting the flat grasslands are a number of shallow ponds. 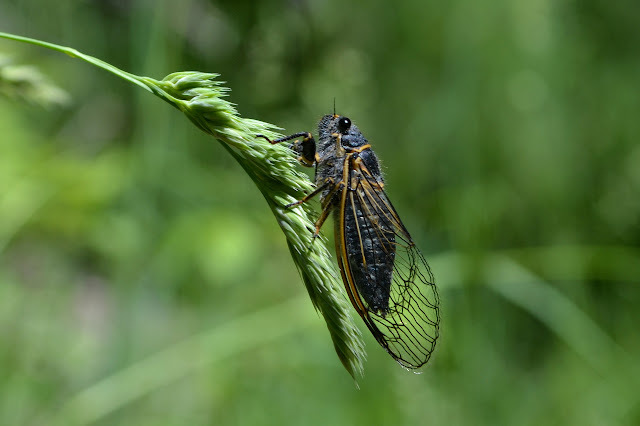 Some areas are marshy and require careful foot placement to keep dry feet. One of the ponds along the way. 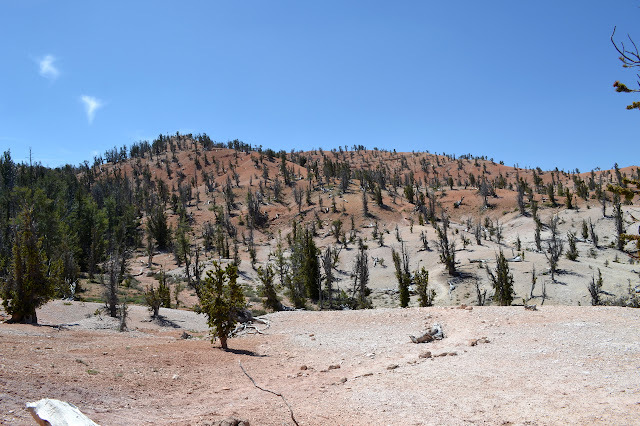 Looking out over Soda Springs Basin (Green River side). The Candlestick Tower is in the distance near the right hand cliffs. 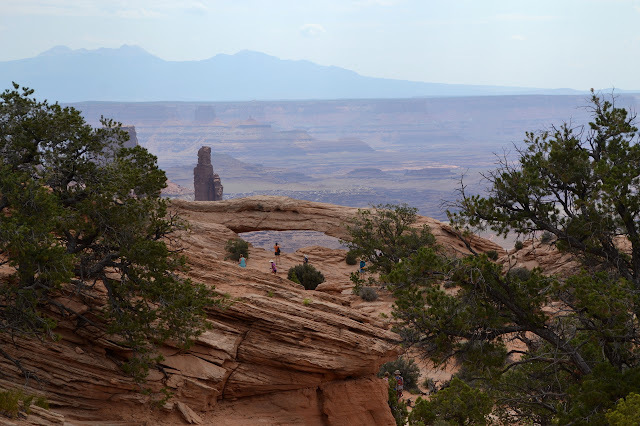 Hanging off the edge of the Island in the Sky is the Mesa Arch. We stopped to have a look, which requires bout a half mile walk along one or both sections of a loop trail. The trail is a well trod path through the sand and sages, generally quite well marked by people traveling along it, but also by cairns when it crosses rocks. Starting along the trail toward the cliff and the arch at the edge of the Island in the Sky. First look at Mesa Arch. I took a fancy to a loop I saw on the map which someone else must have also taken quite a fancy to because it has been made a National Recreation Trail. At nearly 11,200 feet, it should not be too warm either. 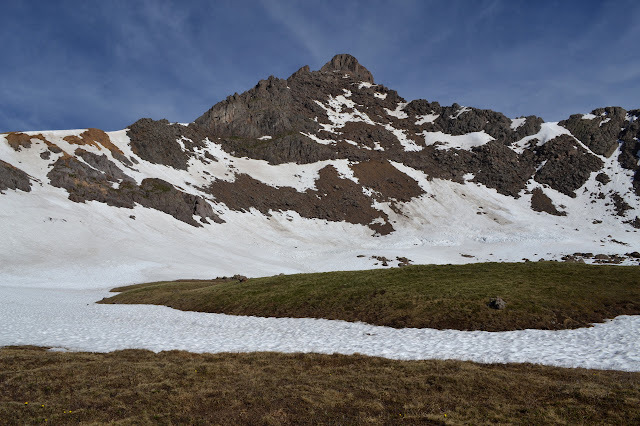 In fact, while stopping off at the nearby Visitor Center to get a map for backpacking later, I am told there is still snow to clamber over although people have been making it. 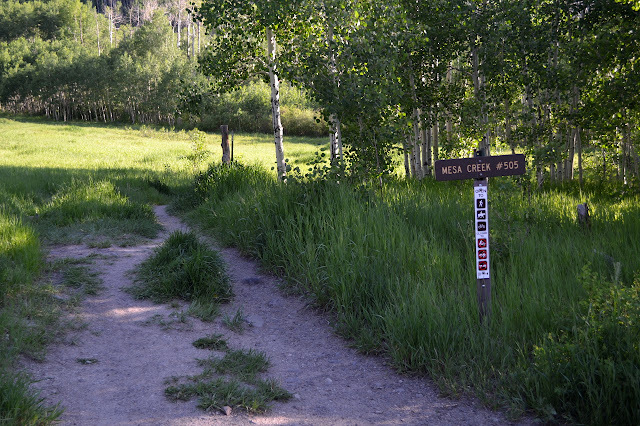 There is a little snow at the trailhead just under 10,500 feet, but this only makes a bit of mud to clamber through. A cartoon map illustrates the 12 mile route trough the area. I head out on the connector to the actual loop passing a trail back to the Visitor Center I just came from. Starting on the trail with just a little bit of snow under the trees. The trail climbs a little as it gets to the junction. 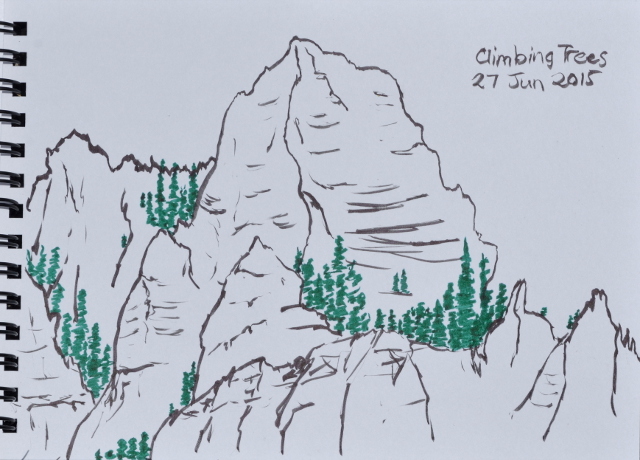 I take the high route, since that just seems much more interesting, and continue to climb. The frogs in a brown pond come to a sudden stop as I approach. 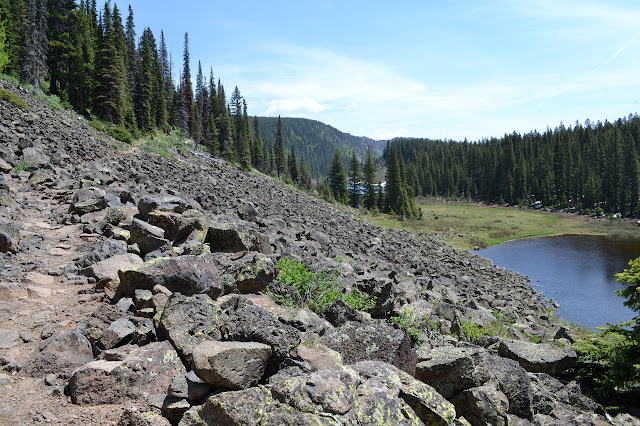 The trail climbs among a jumble of rocks to views to the south and another pond that is a little bigger and a little bluer. Further on, there is the long and even bluer Wolverine Lake. The trail keeps climbing up past a small stream and back into trees. The second pond and Wolverine Lake peeking through the trees as the trail climbs the crest. 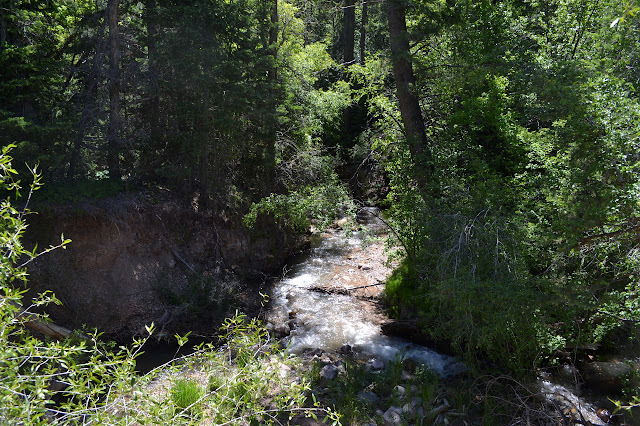 Mesa Creek is the site of the first ski run on Grand Mesa before being abandoned for Powderhorn. At the trailhead, there is a large informational sign all about it. Behind that is a trail sign and a trail. This trail does not appear on my map, so it is difficult to know where it goes, 1.2 miles to nice views according to some sources. Hikers, horses, and bikes allowed. No motor vehicles. I aimed at starting the Rabbit's Ear Trail in time to finish around sunset, somehow doing the math without quite understanding how late sunset is this time of year. I am trying to get around the other thing that happens this time of year: it is very hot. The car thermometer reads 104°F at 6PM when I get to the trailhead. 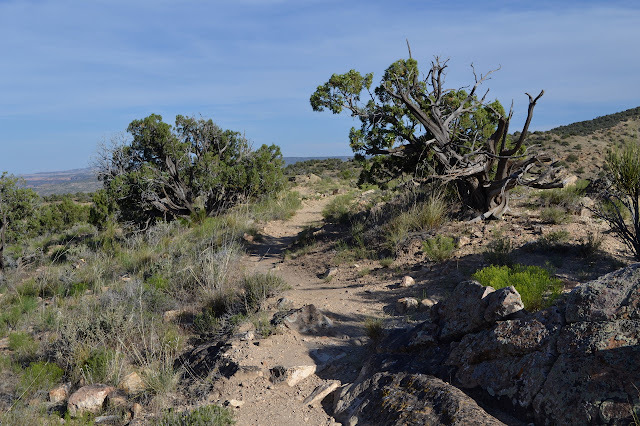 The trail is a lollipop, traversing a ridge to the north end of the Rabbit's Ear Mesa, then looping around the edge. 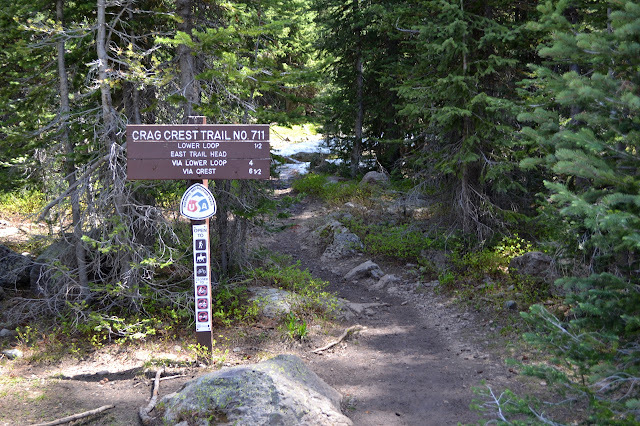 A sign with a large topographic map claims it is 5.6 miles total while the loop is 4.2 miles and the stick 1.4 miles, a total of 7 miles to finish. At this temperature, that can be over a liter of water difference, so very important to planning what to bring. I have four liters and grab it all and very little else. It seems like too little as I listen to the giggles from the people playing cards in their air conditioned camper next to me. Juniper and sage make up most the local vegetation. There is a trail register at the start. The trail seems to get quite a bit of use including a group of three that hiked it this morning. 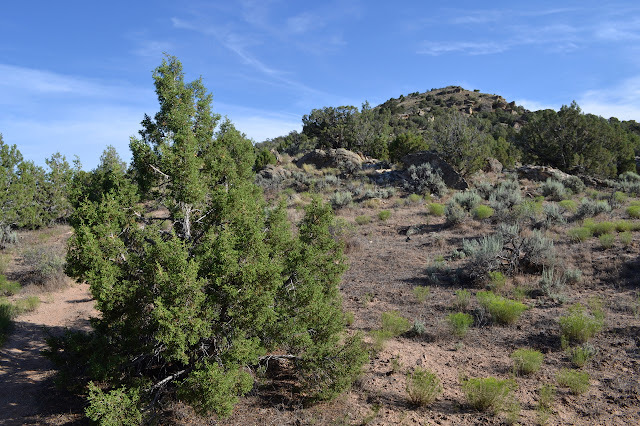 Juniper and sage bush are the most visible of the sparse plants around. The sage bush looks like the local stuff, but smells a little different. The trail climbs upward in a very lazy way. Most of the total 700 foot climb will be along it. Mack spreads out below with a little bit of climbing. The curve of the Colorado River can be found with a little more climbing. The town of Mack across the interstate is seen, but not heard. Another tortured juniper beside the trail. One last excursion up First Left Hand Canyon, just across the road from the first excursion, hiking to a formation called Noah's Ark. The trail leaves from within the Vermilion Castle Campground. It is signed, but does not have any dedicated parking next to the trailhead. There are spaces near the start of the campground. 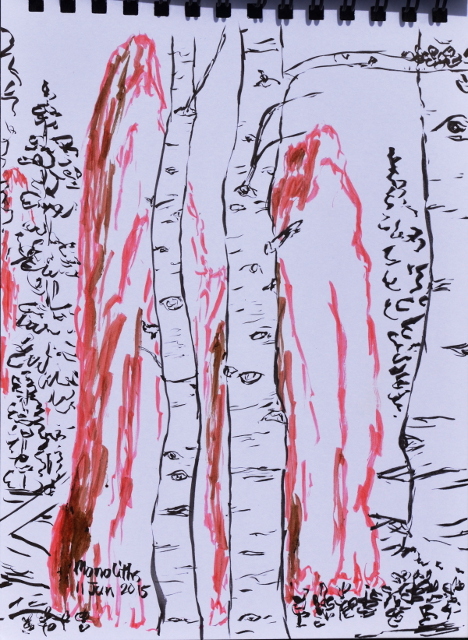 I set off up the gentle slope bellow the trees. The gentle slope is soon replaced with a moderate slope. There are a few (four total) small downed trees to jump over, but none are difficult to navigate. 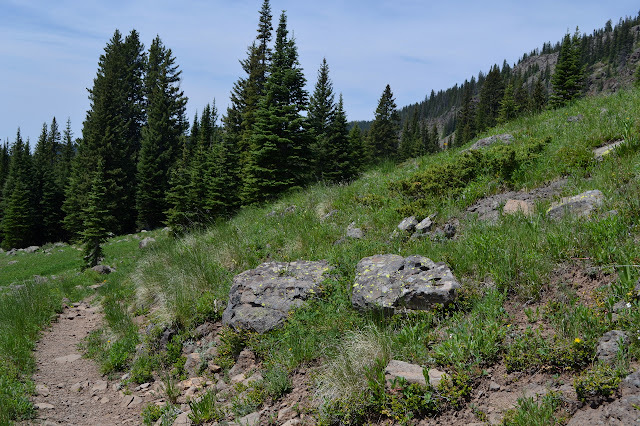 Reaching a short ridge line, the trail gets dim (and likely there is old trail under another downed tree), but there is still only one way that looks likely and it is correct so navigation continues to be simple. Above the dim trail area, there is quite obvious trail. Access to the little monument is mostly turnouts along the road although there are a couple short trails. Checking out the cliffs to the north. 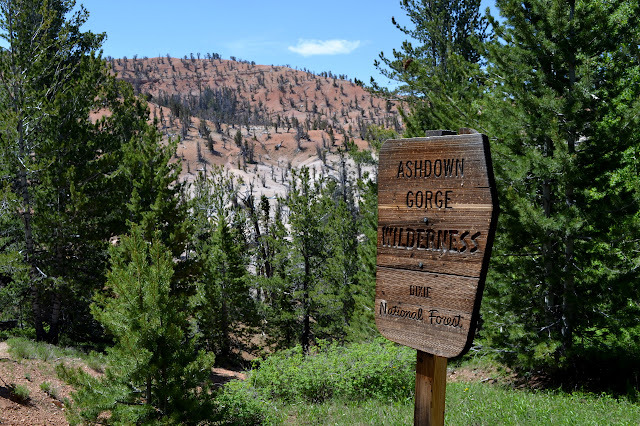 It is unexpected while standing among the aspens and spruce, but right about at the edge of Ashdown Gorge Wilderness the soil changes and conditions are good for Bristlecone Pines. 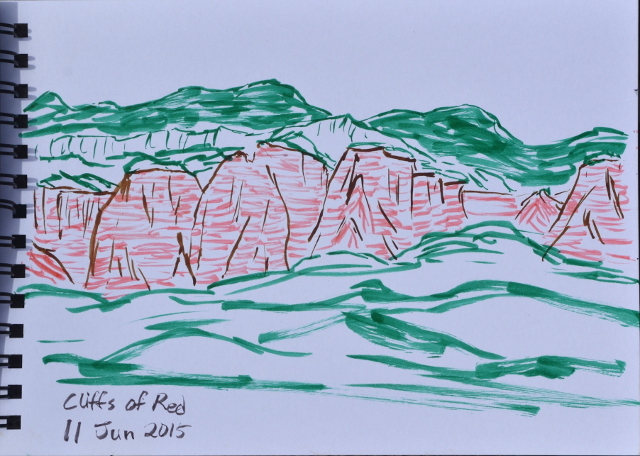 We walk through a break in the thick wall of bright green to find ourselves looking at a bleak landscape of red and tan decorated with the twisted forms that give the trail its name. Walking past the sign with the trail among the trees ahead visible. Following the rock lined trail into the bleak landscape. Beating up the AWD on Second Left Hand Canyon was largely successful with only one spot (a tiny creek) that required some reevaluation for how to get across. At the top, as I rolled over a short barrier of dirt purposely placed, I found a little car with occupants who seemed to be evaluating if they could make it. The answer to their question is "no" and even the SUV caused some surprised expressions on a couple mountain bikers coming down the road. They did signal some pretty smooth sailing the rest of the way. Of course, turning to go back to Brian Head means passing by the road up to the Brian Head. Not actually at Brian Head yet, but the view from this spot along the smoother dirt road near a trailhead that goes to the peak is a little better. The plan for today is to beat up the AWD on Second Left Hand Canyon with a few stops for little hikes. 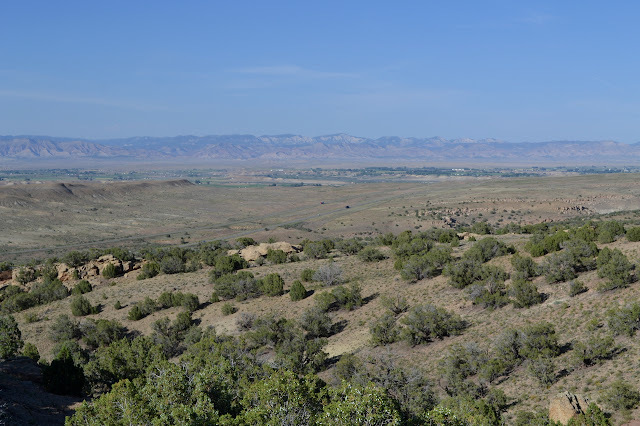 The first stop is a large gravel parking lot with a mysterious sign reading "Parowan Canyon Wildlife Management Area" and no other information, although it adds, "We manage this property to benefit wildlife and wildlife enthusiasts." A designed hole in the fence has a trail through it that proceeds downstream. Geocaches in the area mention a waterfall, so I figure I will simply poke around for a bit, see a waterfall, and head out again. The trail wanders at first beside the creek. The creek below is a little bit muddy, but less than a few days ago. 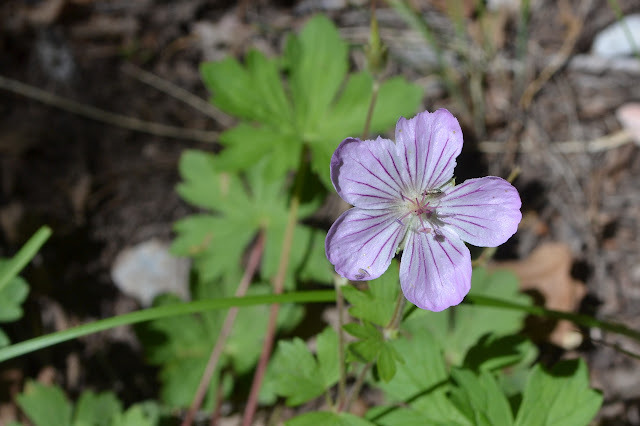 A few flowers are along the side. The singing is quite loud in the morning heat. After dropping in at Pipe Spring National Monument and taking in the view of the Grand Staircase, it is time for the main goal of the day looking about: the north rim of the Grand Canyon. Now, that is quite a benchmark. The lodge is an easy place to start. There are a number of trails and a general light crowd traveling them. Such is the fate of being in one of the best known national parks. The other rim is probably worse and hotter too. The south rim is way out there. Look very carefully and you can pick out the trail climbing it. 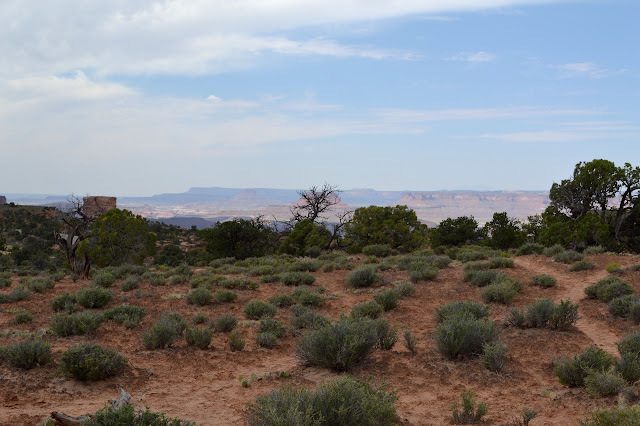 There are a few places to try to take in the Grand Staircase of Grand Staircase-Escalante National Monument. It is, in a word, massive. One might even go so far as to say Grand. A few of the steps get a bit lost in the distance. It is all staircase as far as the eye can see. Trying to recover the steps from the distance. Red (vermilion), then white, then pink for the major ones. Traveling with a couple people who are set on filling their National Park passport is that you end up stopping at even the smallest attraction. Passing within fourteen miles of Pipe Spring, we had to stop and see it. Although small, people do seem to enjoy it for an hour or two. We found some instant joy upon arrival simply because the cactus was in bloom. 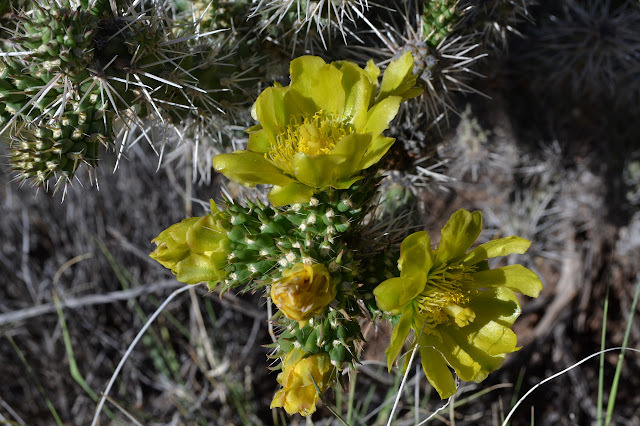 A few of the cactus blooms. Enter and flash and "American the Beautiful" card (or pay the fee) and take a look around. The center is the usual with a few souvenirs one could buy and a movie that is not quite ready to play right now, so we head out the back door into the yard, which is far more interesting. It is full of items from the era when the area was settled by Mormons. Poke around them a little and you notice something odd, they seem to actually be in good working order. A couple carts in the yard. Getting off the shuttle at The Grotto, there are quite a few trails to choose from. 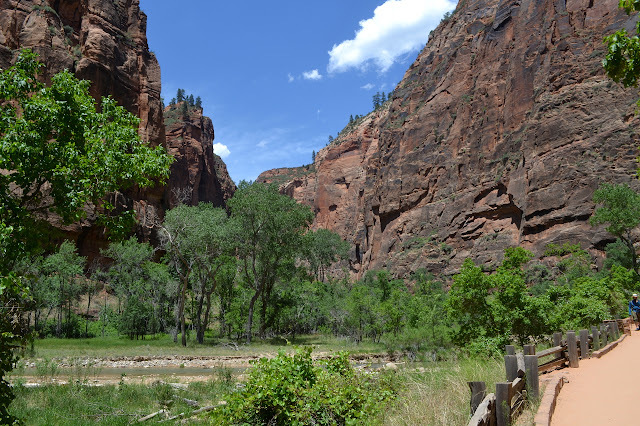 Across the street and the bridge, there is a trail heading up to Angel's Landing and one to some shallow pools. 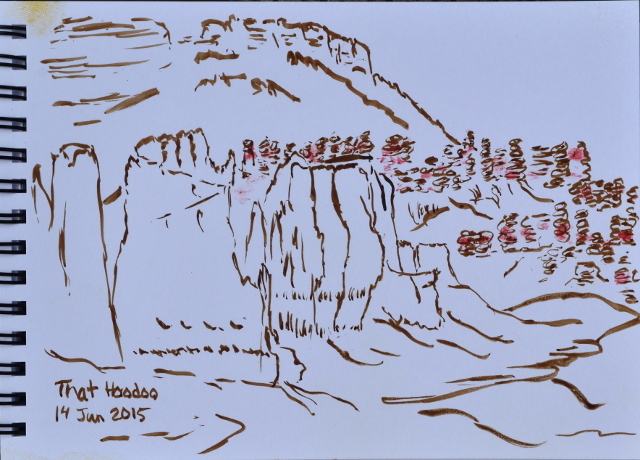 The one I really want to do is on the right to climb the cliffs, but the time barely allows for the one on the left. 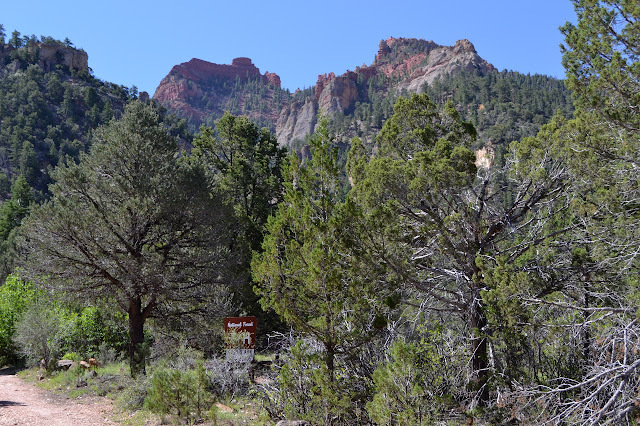 I turn onto the Kayenta Trail, apparently named for the rock formation it travels along, toward the Emerald Pools. Various pieces of park literature point out that these are named for the algae growing in them giving them a green tint, which sounds downright mundane to me. Much more interestingly, these are hanging pools. Looking down the canyon in the late day. One of the trail choices from The Grotto follows next to the river. The Great White Thrown right across the valley. 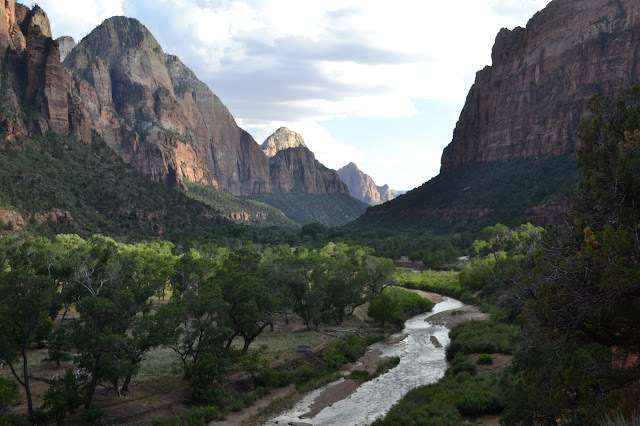 Zion in the late Spring is crazy, but here we are. Attempts at parking extend well into Springdale, lining every street with cars that only want to be near there, not actually there. 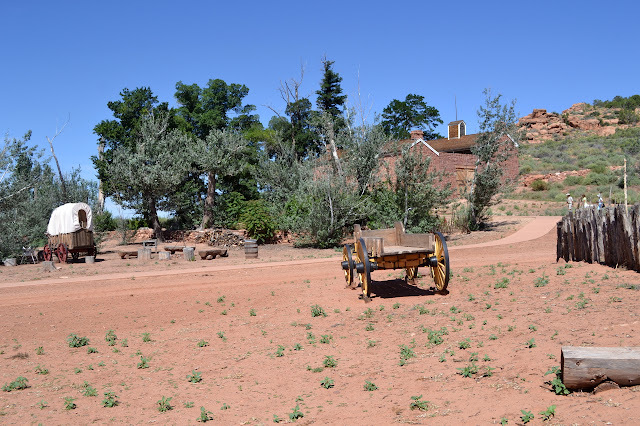 We manage a spot by the Visitor Center, but only after foolishly looking for something "closer" to the Floor of the Valley Road where private cars are not allowed. The Visitor Center parking is large while everything else is not. Once walking access to the shuttle buses is had, things go smoothly if a little claustrophobic. The bus goes along as long as the canyon is wide enough to hold a road. When it is no longer so wide, we start off on the trail. Looking down the canyon to the Great White Throne, where things are sufficiently wide for a road. Looking up the canyon, things get very narrow. 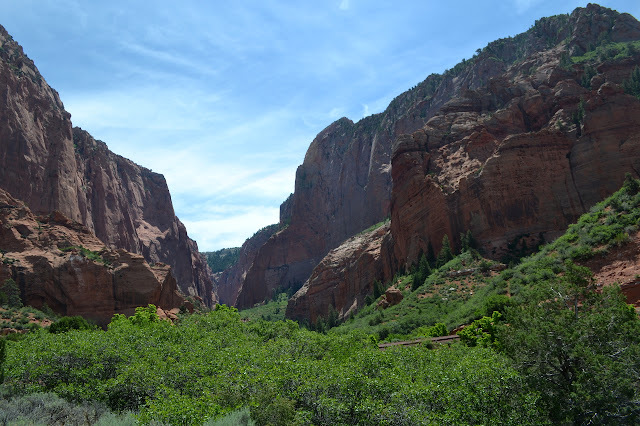 Kolob Canyons looks like it would be a stunning place to be hiking, but I only dipped into for a close up view of what had been far across the interstate while recently backpacking. The short road wraps around to a high point for a view into the canyons, but the best view is actually a little lower than the end. Trails proceed much deeper into the canyons. 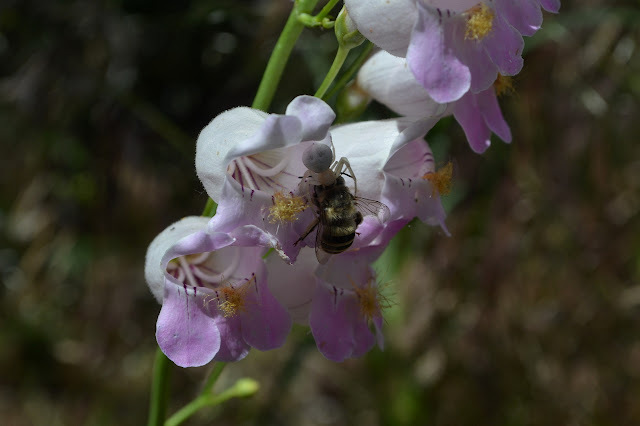 Wondering why this bee was so still, I found the spider.